Dhaka, 30 Oct, Abnews: The theory at the heart of most diet programmes is that people trying to shed a few pounds should be spending more calories than they consume; therefore, the two biggest factors to consider when trying to lose weight are cutting down on calories and getting more exercise. But as well as focussing on not eating too much, the habits you form around eating, food preparation and even food shopping merit important consideration too, and can make a difference when it comes to achieving your weight loss goals. Making small adjustments such as those below might not help you lose a radical amount of pounds overnight; but they will help you to better manage your appetite, and adopt a healthier attitude towards food. Many people might see breakfast as the most convenient option for removal when it comes to reducing calorie intake. However, skipping breakfast isn’t associated with weight loss. In fact, experts believe that omitting this meal from the daily regimen might actually cause some to eat more as the day wears on. Katherine Zeratsky, a dietetic expert writing on behalf of Mayo Clinic, expresses the importance of breakfastto prevent the need to snack later on. For this reason, those looking to lose weight should consider breakfast a necessity; but they should also make it a healthy one. To help you feel full but give you the energy you need, nutritionists generally recommend that the first meal of the day should be high in both fibre and protein. Oily fish such as salmon and eggs are popular protein-rich breakfast choices, as are natural yoghurt, nuts and seeds, fruits and high-fibre cereals. When you’re hungry you will be prone to stacking your trolley with more food than you might necessarily need; so try to take advantage of quieter supermarkets late at night, and do your ‘big shop’ after dinner. If you shop on a full stomach, you are more likely to take notice of the labels on foods, make sensible choices and buy a balanced range of items. Timing your shop to take place on the right days can help too. For instance, going food shopping on a Thursday or a Friday will help you plan your meals over the weekend more easily, and make you less likely to order takeaway on a Saturday night. Supermarkets do tend to be busier on Monday evenings, which might serve to encourage rushed, unhealthy choices if you’ve set aside this night specifically to get your groceries. The closer you can arrange your shop to take place between the middle of the week and the weekend (Wednesday to Friday are usually ideal), the better for your trolley, and your diet. Having dinner late at night is an easy habit to fall into. The consensus among dieters has long been that the later you consume calories, the harder they are to shift. However, there is little in the way of definitive research to prove this. The link between late night eating and weight gain is, some experts believe, more to do with what you eat. Those who get in late from a long day are thought to be more likely to consume food high in calories or saturated fat (or both), in reaction to stress or a heavy workload, or a long period of hunger. This, done habitually, can lead to an increased overall calorie intake, which can of course make losing weight harder. Experts advise that 90 percent of daily calories should be consumed before 8pm, and to eat regularly, as this will help to regulate blood sugar levels in the body. Remember that if circumstances do cause you eat later than normal, don’t overdo it, and be careful with calorie intake. What makes drinking water alongside eating a meal conducive to weight loss? There are several reasons behind the theory. One is that water which has no calorie value is obviously a less calorific option than high calorie drinks such as milkshakes, luxury coffee variations or alcohol. Another is that it helps to fill your stomach with a zero-calorie substance, which means you won’t need to eat as much to feel full. One study of 48 55-75 year olds found that dieters who drank water before meals typically shed between three and four pounds more over the course of 12 weeks than those who didn’t. Another study has also linked higher water consumption with a decreased calorie, saturated fat, salt and sugar intake in an adult test group. If you’re dehydrated, the body can send mixed signals to the brain leading you to think you’re hungry, when if fact you are simply thirsty. Even mild feelings of dehydration can lead to tiredness, which might encourage you to snack on sugary treats in order to get the energy boost you need to make it through the day. Drinking water can help to reduce these ‘false hunger’ pangs, and help to prevent you from snacking on food (when you don’t really need it). If you’re serving dinner on a large plate, you’re more likely to serve a hefty quantity of food to fill it up, and then overeat when trying to clear your plate. Using a smaller plate will give the appearance of a bountiful meal, and you’ll still feel satisfied after emptying your plate. Professors Wansink and van Ittersum refer to the theory of The Delboeuf Illusion to explain this, which states that the more ‘white space’ there is around a plate of food, the less substantial it will appear to be to the naked eye. These two experts theorise that the colour of someone’s plate can also have an effect on volume perception. The idea is to do with contrast. They conducted an experiment with white and red plates, and two different pastas; one in a red and one in a white sauce. They found that those who had a ‘low contrast’ between their food and their plate served themselves 30% more than those with a more pronounced contrast. 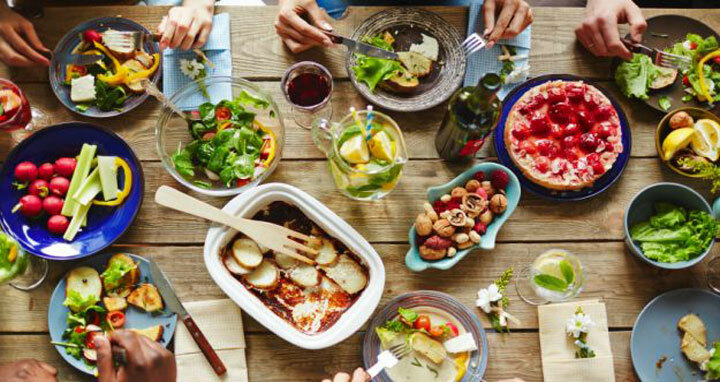 Similarly, sharing dishes are great for social gatherings, but they can encourage those participating in many cases to overindulge. Once again, keeping track of what you’ve eaten becomes more of a challenge; and nobody likes waste, so people may feel more inclined to eat the last couple of piece on a plate to be socially polite. If you’re out at a restaurant or cooking for a gathering at home and want to keep a tighter leash on your calorie intake, smaller individual dishes are always going to provide a more stable opportunity for you to monitor the calories you consume. Cutting out sweets and treats entirely is a commendable course of action when trying to lose weight; but it isn’t always a sustainable one. The more restrictive your diet is in absolute terms, the tougher it will be to stick to, and the more likely it is that the relapse into treat foods will be a considerable one. A more sustainable approach is to not completely give treats up; but to keep them as an occasional indulgence. Most of our favourite crisps and snacks now come in huge bags or tubes, which are supposedly for sharing, but can be easy for one person to eat when in a particularly self-indulgent mood. Emptying a smaller serving of crisps into a bowl or putting a couple of biscuits on a plate, instead of eating straight from the packet, can stop you from overdoing it as you are less likely to keep eating if the food is not in front of you. Modern lifestyles often necessitate speed and convenience, so the urge to eat quickly can be compelling. But eating too fast can cause you to eat too much, as your body will need time to register that you are full before relaying this information to your brain. Try chewing your food properly, taking a short gap between mouthfuls and eating without distractions. It can take around 20 minutes for the brain to register satiety, which means savouring and enjoying your meal could well mean that you will eat less. It might at first seem counterproductive to make more food when cooking, especially when trying to lose weight. But having enough of dinner left over for another meal and using it for lunch the following day will enable you to have a healthy home cooked meal at work, and reduce the likelihood that you’ll opt for a processed microwave meal or lunch from a restaurant (both of which are likely contain more calories and salt). The added bonus is that, with many home-cooked meals, putting them in the fridge before reheating them and eating the next day enables the flavours to infuse for longer, meaning that the dish will (in theory at least) taste even better the next day. However, do be careful with high-risk foods. Rice can be difficult to reheat safely, shellfish can be particularly risky, and chicken and other meats should only be reheated once after they’ve been allowed to cool and refrigerated. There are no ‘official’ health guidelines on reheating food, but the NHS website does have some useful pageson food safety which touch on subjects such as reheating rice. Crash diets might work in the short term, but most of us will find it hard work to sustain them for any period of time, and you may find the weight returns quickly afterwards (this is also known as weight cycling). Their effect on long-term health is also unclear. Small changes to your eating habits and lifestyle, such as those listed here, can help you to lose weight, and may be much easier to maintain than diets that involve cutting out whole food groups or buying expensive slimming foods.